Agriculture (11% of GDP): Major products--rice, tea, rubber, coconut, and spices. Services (59% of GDP): Major types--tourism, wholesale and retail trade, transport, telecom, financial services. Industry (29% of GDP): Major types--garments and leather goods, rubber products, food processing, chemicals, refined petroleum, gems and jewelry, non-metallic mineral-based products, and construction. Trade: Exports--$8.3 billion: garments, tea, rubber products, jewelry and gems, refined petroleum, and coconuts. Major markets--U.S. ($1.77 billion), U.K., India. Imports--$13.5 billion. Major suppliers--India, Singapore, Hong Kong, China, Iran, Malaysia, Japan, U.K., U.A.E., Belgium, Indonesia, South Korea, U.S. ($178 million). The Democratic Socialist Republic of Sri Lanka (formerly known as Ceylon) is an island in the Indian Ocean about 28 kilometers (18 mi.) off the southeastern coast of India with a population of about 21 million. Density is highest in the southwest where Colombo, the country's main port and industrial center, is located. The net population growth rate is about 1%. Sri Lanka is ethnically, linguistically, and religiously diverse. Other minorities include Muslims (both Moors and Malays), at about 7% of the population; Burghers, who are descendants of European colonists, principally from the Netherlands and the United Kingdom (U.K.); and aboriginal Veddahs. Most Sinhalese are Buddhist; most Tamils are Hindu. The majority of Sri Lanka's Muslims practice Sunni Islam. Sizable minorities of both Sinhalese and Tamils are Christians, most of whom are Roman Catholic. The 1978 constitution--while assuring freedom of religion--grants primacy to Buddhism. The UNP's Ranasinghe Premadasa, Prime Minister in the Jayewardene government, narrowly defeated Mrs. Bandaranaike (SLFP) in the 1988 presidential elections. The UNP also won an absolute majority in the 1989 parliamentary elections. Mr. Premadasa was assassinated on May 1, 1993 by the Liberation Tigers of Tamil Eelam ("LTTE" or "Tigers"), and was replaced by then-Prime Minister Dingiri Banda Wijetunga, who appointed Ranil Wickremasinghe Prime Minister. The SLFP, the main party in the People's Alliance (PA) coalition, returned to power in 1994 for the first time in 17 years. The PA won a plurality in the August 1994 parliamentary elections and formed a coalition government with Chandrika Bandaranaike Kumaratunga as Prime Minister. Prime Minister Kumaratunga later won the November 1994 presidential elections and appointed her mother (former Prime Minister Sirimavo Bandaranaike) to replace her as Prime Minister. President Kumaratunga won re-election to another 6-year term in December 1999. In August 2000, Mrs. Bandaranaike resigned as Prime Minister for health reasons, and Ratnasiri Wickramanayake was appointed to take her place. In December 2001, the UNP assumed power, led by Prime Minister Ranil Wickremasinghe. Chandrika Kumaratunga remained as President. In November of 2003, President Kumaratunga suddenly took control of three key ministries, triggering a serious cohabitation crisis. Presidential elections were held in November 2005, with Mahinda Rajapaksa becoming President, and Ratnasiri Wickramanayake becoming Prime Minister. President Rajapaksa stood for re-election 2 years before the end of his term, in January 2010, and was reelected by a margin of 18% over the opposition candidate, retired Army General Sarath Fonseka. The presidential elections were soon followed by a large victory for Rajapaksa’s UPFA coalition in April 2010 parliamentary elections, where it captured 144 out of 225 seats possible, just shy of a two-thirds majority. The remaining parliamentary seats were secured by the United National Front (60), the Tamil National Alliance (14), and the Democratic National Alliance (7). In October 1997, the U.S. Government designated the LTTE as a foreign terrorist organization under provisions of the Anti-Terrorism and Effective Death Penalty Act of 1996 and has maintained this designation since then, most recently redesignating the group in October of 2003. The U.S. Government in November 2007 froze the U.S.-held assets of the Tamils Rehabilitation Organisation, a charitable organization associated with the LTTE, and in February 2009, the U.S. froze the assets of the Maryland-based Tamil Foundation, on suspicion that they were funneling money to the LTTE. In March 2004, Eastern Tiger commander Karuna broke with the LTTE, going underground with his supporters. In March 2006, the Karuna faction registered a political party, the Tamil People's Liberation Tigers (TMVP). The LTTE and the Karuna faction began targeting each other in low-level attacks. In late 2007, Sivanesethurai Chandrakanthan ("Pillaiyan") took over the leadership of the TMVP. In March 2008, Karuna left the TMVP and joined President Rajapaksa’s SLFP as Minister for National Reconciliation. During the November 2005 presidential election, the LTTE enforced a voting boycott in areas under its control. As a result, perceived hard-liner and Sri Lanka Freedom Party (SLFP) leader Mahinda Rajapaksa won by a narrow margin. Low-level violence between the LTTE and security forces escalated. In December 2005, pro-LTTE Tamil National Alliance Member of Parliament (MP) Joseph Pararajasingham was assassinated within a GSL high-security zone in the eastern town of Batticaloa. In February 2006, exactly 4 years after the ceasefire agreement was signed, the GSL and LTTE renewed their commitment to the agreement at talks in Geneva. There was a lull in violence until April 2006, when an explosion rocked a Sinhalese market in Trincomalee, followed by limited Sinhalese backlash against Tamils. Several days later, an LTTE suicide bomber attacked the main army compound in Colombo, killing eight soldiers and seriously wounding Army Commander General Fonseka. The government retaliated with air strikes on Tiger targets. In June 2006, an LTTE suicide bomber succeeded in killing Army third-in-command General Kulatunga in a suburb of Colombo. The European Union (EU) banned the LTTE as a terrorist organization on May 30, 2006. In June 2006, GSL and LTTE delegations flew to Oslo to discuss the future of the Scandinavian-led Sri Lanka Monitoring Mission (SLMM). The Tigers refused to sit for talks with the GSL and instead demanded the SLMM remove any monitors from EU-member nations. Government troops took control of the LTTE's eastern stronghold of Vakarai in January 2007, resulting in thousands more internally displaced persons (IDPs). In March 2007, the Tamil Tiger rebels launched their first-ever air attack, which targeted the Katunayake Air Force base adjacent to Bandaranaike International Airport. By July 2007, however, the government had recaptured the remaining territory held in the Eastern Province from the Tigers. In November 2007, a Sri Lankan Air Force bomb killed LTTE political chief and number two leader, S.P. Tamilchelvan. Also during that month, the LTTE detonated a bomb in a busy Colombo shopping center, killing 17 and wounding many more. The conflict entered a new phase in September 2008 when government forces initiated an offensive on LTTE, resulting in significant losses of LTTE territory. The government continued to capture territory in northern Sri Lanka through May 2009, when fighting became confined to a small area of land near Mullaitivu, where thousands of civilians were forcibly held by the LTTE in a government-designated “no fire zone”. On May 19, the government declared victory over the LTTE as they reported the capture of remaining Tiger-held territory and the death of LTTE leader Velupillai Prabhakaran. The end of the military conflict resulted in nearly 300,000 internally displaced persons and allegations of potential violations of international humanitarian law and other harms committed by both sides in the final stages of the conflict. IDPs were initially detained at camps, primarily in Vavuniya area, but IDPs have been permitted freedom of movement since December 2009. Most IDPs have since returned to their home districts, staying primarily with host families. But many have not been resettled in their homes, due to the lingering presence of land mines and government-enforced high-security zones. To date, international non-governmental organizations, working in coordination with the Government of Sri Lanka and the United Nations, have removed a reported 1.1 million land mines. The humanitarian effort continues to progress--as of May 2010 it was estimated that 68,000 IDPs remained within the camps. Sri Lanka's two major political parties--the UNP and the SLFP--have historically embraced democratic values, international nonalignment, and encouragement of Sinhalese culture. However, the SLFP-led coalition government under President Rajapaksa, aided by emergency regulations, has consolidated political power in the executive and limited media freedom and the role of civil society in Sri Lankan politics. Sri Lanka has a multi-party democracy that enjoys considerable stability despite relatively high levels of political violence during its 26-year civil conflict. In May 2009, the government declared victory over the LTTE and the LTTE’s longtime leader, Velupillai Prabhakaran, was killed. The LTTE’s terrorist activities had generally been aimed at destabilizing Sri Lanka politically, economically, and socially. Economic targets included the airport in July 2001, the Colombo World Trade Center in October 1997, and the central bank in January 1996. In January 1998, the LTTE detonated a truck bomb in Kandy, damaging the Temple of the Tooth relic, the holiest Buddhist shrine in the country. 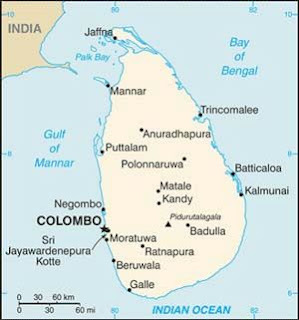 After a lull following the 2002 ceasefire, LTTE-perpetrated terrorist bombings directed against politicians and civilian targets became more common in Colombo, Kandy, and elsewhere in the country. LTTE attacks on key political figures included the attempted assassinations of Social Affairs Minister Douglas Devananda in November 2007 and of Secretary of Defense Gothabaya Rajapaksa in December 2006, the assassination of Army General Kulatunga in June 2006, the attempted assassination of Army Commander General Fonseka in April 2006, the assassination of Foreign Minister Lakshman Kadirgamar in August 2005, the killing of the Industrial Development Minister by suicide bombing in June 2000, and the December 1999 attempted assassination of President Kumaratunga. The LTTE is also suspected of being behind the assassinations of two government ministers in early 2008. In the year following the defeat of the LTTE, the Sri Lankan Government has faced widespread criticism on human rights issues. Shortly after his defeat in the January 2010 presidential election, retired Army General Sarath Fonseka was arrested and sequestered without facing formal charges. He eventually was charged with engaging in politics while still a serving military officer and corruption in military procurements and tried by two courts martial, which found him guilty in September 2010 and sentenced him to 30 months in prison and stripped him of his pension and all military honors. The Government of Sri Lanka received appeals from the international community that any action against the former Army general be pursued in accordance with Sri Lankan law and consistent with Sri Lanka’s political traditions, but many observers regarded Fonseka's prosecution and conviction as politically motivated. The Sri Lankan Government received praise for pardoning Tamil journalist J.S. Tissanayagam in May 2010, but concerns remain about the state of media freedom and the ability of Sri Lankans to express dissent against government policies and actions. Sri Lanka is a lower-middle income developing nation with a gross domestic product of about $50 billion (official exchange rate). This translates into a per capita income of $5,100 (purchasing power parity). Sri Lanka's 91% literacy rate in local languages and life expectancy of 75 years rank well above those of India, Bangladesh, and Pakistan. English language ability is relatively high, but has declined significantly since the 1970s. Sri Lanka's income inequality is severe, with striking differences between rural and urban areas. About 15% of the country's population remains impoverished. The effects of 26 years of civil conflict, falling agricultural labor productivity, lack of income-earning opportunities for the rural population, high inflation, and poor infrastructure outside the Western Province were impediments to poverty reduction. There are reports that poverty has been decreasing significantly in the last few years. In 1978, Sri Lanka shifted away from a socialist orientation and opened its economy to foreign investment. But the pace of reform has been uneven. A period of aggressive economic reform under the UNP-led government that ruled from 2002 to 2004 was followed by a more statist approach under President Mahinda Rajapaksa. Despite a brutal civil war that began in 1983, economic growth has averaged around 5% in the last 10 years. Due to the global recession and escalation of violence during the final stages of the war, GDP growth slowed to 3.5% in 2009 and foreign reserves fell sharply. Business confidence rebounded quickly with the end of the war and an International Monetary Fund (IMF) agreement in July 2009. Consequently, Sri Lanka recorded strong growth in 2010, as GDP grew by 8%. Official foreign reserves, including borrowings, reached $6.6 billion (5.9 months of imports). The post-war economic re-integration of northern and eastern provinces has boosted agriculture and fisheries, although a large area of agricultural land was damaged by floods in early 2011. Reconstruction of the war-damaged areas as well as infrastructure development throughout the country is also fueling growth. Tourism has rebounded strongly to record levels. Exports grew by a healthy 17% in 2010. Foreign remittance inflows from Sri Lankans working abroad swelled to $4.1 billion in 2010 from $3.3 billion in 2009. The Colombo Stock Exchange was the second-best performing market for the second year in a row. Inflation, which had reached double digit levels during the war years, was around 7% in 2010. Inflation pressures are building, and inflation reached 8.6% in March 2011. Foreign direct investment (FDI) remained relatively low in 2010 at about $450 million. The FDI target for 2011 is $1 billion, including investments in the tourism sector. Government fiscal control remains a concern. The budget deficit reached almost 10% of GDP in 2009, but was forecast to fall to around 8% of GDP in 2010. President Rajapaksa's broad economic strategy outlined in his 2005 and 2010 election manifestos, "Mahinda Chintana" (Mahinda's Thoughts), guides government economic policy. Mahinda Chintana policies focus on poverty alleviation and steering investment to disadvantaged areas; developing the small and medium enterprise (SME) sector; promotion of agriculture; and developing Sri Lanka to become the regional hub of ports, aviation, commerce, knowledge, and energy. The government has developed a 10-year development framework to boost growth through a combination of large infrastructure projects. The Rajapaksa government rejects the privatization of state enterprises, including "strategic" enterprises such as state-owned banks, airports, and electrical utilities. Instead, it plans to retain ownership and management of these enterprises and make them profitable. The Mahinda Chintana plan aims to double Sri Lanka’s per capita income to $4,000 within 6 years. To do so, Sri Lanka requires GDP growth well over 8%, and the investment rate needs to rise from 25% of GDP to 35% of GDP. Sri Lanka’s economy will continue its post-war resurgence and is expected to grow strongly in the immediate term. Although Sri Lanka should maintain moderate economic growth, Sri Lanka needs to enact important policy reforms to reach its full economic potential. Sri Lanka has set the goal of improving its business climate, but must follow through with reforms to decrease bureaucratic red tape; increase transparency, particularly in government procurement; and increase the predictability of government policies. Sri Lanka must also continue to improve its fiscal discipline. The 26-year conflict and high government expenditure have contributed to Sri Lanka's high public debt load (83% of GDP in 2009). Sri Lanka depends on a strong global economy for investment and for expansion of its export base. It has been advised to diversify export products and destinations to make use of the Indo-Lanka and Pakistan-Sri Lanka Free Trade Agreements and to benefit from rapid economic growth in emerging East Asia. Sri Lanka's exports to the European Union qualified for duty-free entry under the EU Generalized System of Preferences (GSP) Plus market access program, granted in 2005 to help Sri Lanka rebuild after the 2004 tsunami. However, after a lengthy review process, the European Union suspended the GSP Plus market access benefit in August 2010, due to Sri Lanka’s poor human rights record. Nevertheless, Sri Lanka’s exports grew strongly by over 17% in 2010, despite the loss of this benefit. Sri Lanka continues to receive limited tariff preferences under the EU GSP program. Sri Lanka also receives preferential access to the U.S. market under the U.S. GSP program. This program has been temporarily suspended pending congressional approval. The service sector is the largest component of GDP at almost 60%. In 2010, service sector growth increased to 8% from about 3% in 2009. Tourism, shipping, aviation, telecom, trading, and financial services were the main contributors to growth. Public administration and defense expenditures increased in recent years due to hostilities, and there has been an expansion of public sector employment. Despite the end of the war, defense expenditures remain at around 3.9% of GDP. There is a growing information technology sector, especially information technology training and software development. Industry accounts for almost 30% of GDP. Manufacturing is the largest industrial subsector, accounting for 17% of GDP. The construction sector accounts for 7% of GDP. Mining and quarrying account for 2% of GDP. Electricity, gas, and water account for 2% of GDP. Within the manufacturing sector, food, beverage, and tobacco is the largest subsector in terms of value addition. Textiles, apparel, and leather is the second-largest sector. The third-largest sector in value added terms is chemical, petroleum, rubber, and plastic products. Agriculture has lost its relative importance to the Sri Lankan economy in recent decades. It employs 31% of the working population, but accounts for only about 11% of GDP. Rice, the staple cereal, is cultivated extensively. The plantation sector consists of tea, rubber, and coconut; in recent years, the tea crop has made significant contributions to export earnings. Domestic agriculture such as rice and other food crops improved significantly with the return of peace to the eastern and northern provinces. However, floods in early 2011 destroyed many crops and livestock, including rice, in the main cultivation period. Sri Lanka's exports (mainly apparel, tea, rubber, gems and jewelry) were estimated at $8.3 billion and imports (mainly oil, textiles, food, and machinery) were estimated at $13.5 billion for 2010. The resulting large trade deficit was financed primarily by remittances from Sri Lankan expatriate workers, foreign assistance, and commercial borrowing. Sri Lanka must diversify its exports beyond garments and tea. The information technology (IT) and business process outsourcing (BPO) sector is small but growing. Exports to the United States, Sri Lanka's most important single-country market, were estimated to be around $1.77 billion for 2010, or 21% of total exports. The United States is Sri Lanka's second-biggest market for garments, taking almost 40% of total garment exports. (The EU as a whole is Sri Lanka's biggest export market and largest apparel buyer.) India is Sri Lanka's largest source of imports, accounting for over 20% of imports. United States exports to Sri Lanka were estimated to be around $178 million for 2010, consisting primarily of machinery and mechanical appliances, medical and scientific equipment, electrical apparatus, wheat, plastics, lentils, and paper. Sri Lanka is a large recipient of foreign assistance, with China, the World Bank, the Asian Development Bank, Japan, and other donors disbursing loans totaling almost $1.0 billion in 2009. China is a major lender for infrastructure projects, such as a new port, a coal power plant, and roads. Iran is also a major lender to Sri Lanka and has committed $450 million for the Uma Oya multipurpose irrigation project and $111 for rural electrification. Iran provides an interest-free credit facility for oil imports. Iran has also promised assistance for modernization of Sri Lanka's only oil refinery, though no firm commitments are in place. The Government of India is providing loans for the railway sector. Foreign grants amounted to $230 million in 2009. There continue to be problems with projects awarded without tenders. The unemployment rate declined to 4.5% in fourth-quarter 2010, from 5.7% in fourth-quarter 2009. Unemployment is highest in the 20-29 age group. The rate of unemployment among women and high school and college graduates has been proportionally higher than the rate for less-educated workers. The government has embarked on educational reforms it hopes will lead to better preparation of students and better matches between graduates and jobs. Approximately 20% of the 7.6 million-strong work force is unionized, but union membership is declining. There are more than 1,900 registered trade unions, many of which have 50 or fewer members, and 19 federations. Many unions have political affiliations. The Ceylon Workers Congress (CWC) and Lanka Jathika Estate Workers Union are the two largest unions, representing workers in the plantation sector. The president of the CWC also is Minister of Livestock and Rural Community Development. Other strong and influential trade unions include the Ceylon Mercantile Union, Sri Lanka Nidhahas Sevaka Sangamaya, Jathika Sevaka Sangayama, Ceylon Federation of Trade Unions, Ceylon Bank Employees Union, Union of Post and Telecommunication Officers, Conference of Public Sector Independent Trade Unions, and the JVP-aligned Inter-Company Trade Union. Public sector trade unions usually resist government moves to restructure state-owned corporations. The Government of Sri Lanka has no plans to privatize any state-owned enterprises, and in some cases the government has reversed prior privatizations. There are 1.7 million Sri Lankan citizens working abroad. A majority are women working as housemaids. Remittances from migrant workers, estimated at around $4.1 billion in 2010, is the most important source of foreign exchange for Sri Lanka, surpassing earnings from apparel exports.